Located on Nicaragua’s east coast, Bluefields is the mainland town with the closest relationship with the Corn Islands. Many of the La Costeña flights from Managua to Big Corn Island touch down for a short stop in Bluefields to leave passengers and pick up new ones, and there is also a lot of boats going back and forth between Big Corn and Bluefields. Bluefields is located in Bluefields Bay, where the Rio Escondido meets the Caribbean Sea. The city, largely founded by pirates and privateers, was named after the Dutch pirate Abraham Blauvelt who frequented this spot in the early 1600s. Today, Bluefields is Nicaragua’s main port on the Caribbean side of the country. Examples of goods exported from here are timber (especially hardwood) and seafoods such as shrimp and lobster. Bluefields is located within the South Caribbean Autonomous Region of Nicaragua and is its capital city. In May each year, Bluefields celebrates Palo de Mayo, a may pole festivity that mingles English and Creole traditions. The most intense week of celebration is the third week of May. La Costena flies back and forth between Managua and Bluefields several times a day. The bus trip from Managua to Rama takes around 6 hours. In Rama, take a panga (small motor boat) to Bluefields; it will take around two hours. There is a dirt road connecting Rama with Bluefields, but no bus service, so people take the panga instead. Another option is to take the bus that goes from Rama to Pearl Lagoon, and then take a panga from there to Bluefields. Every Wednesday morning a cargo boat leaves San Juan del Norte heading for Bluefields. The easiest way to get around in Bluefields is by foot and with the taxis. There are a lot of taxis zipping around looking for passengers, so finding one is easy. Make sure you agree on the price before you get into the taxi. Fixed prices are the norm here; taximeters are not used. In Bluefields, we pay a fixed price per person for journeys within the city, but taxi drivers sometimes take advantage of newcomers and try to get a higher price from them. That is why it’s a good idea to agree on a price in advance. If you have luggage or want to go to or from the airport, that usually costs a little extra. Here are a few examples of hotels located in Bluefields. Located near Mangito Lane. Clean rooms with cable TV and private bathroom. Four-story building located near the wharf, on Calle Neysi Rios. Clean rooms, AC, private bathroom, hot water showers. Cheap, but dodgy and very low standard. Reoccurring bed bug problems have been reported. Located by the Cima Club. Clean rooms with cable TV and private bathroom. Restaurant downstairs. There hasn’t been a sensus for Bluefields since 2005. Back then, 45,547 people lived in the city and an additional 38,623 in the surrounding urban area. 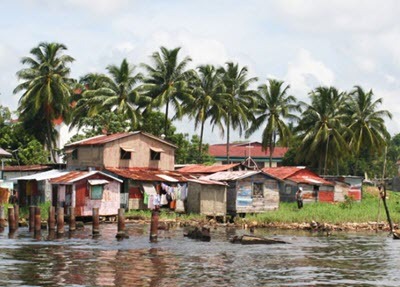 A majority of the population is mestizo, but there are also a lot of creoles of Afro-descent living here, and Amerindians indigenous to the area, especially Miskitu but also some Rama and Mayangna. The Garifuna people are mixed-race descendants of African, European and Amerindian (Kalinago and Arawak) descent. In Bluefields urban area, Spanish is the dominating language. Bluefields have a tropical rainforest climate. The period that runs from February to April is referred to as the dry season, but it rains during this season too – just not as massively as during the rainy season. It is the trade winds that make sure that Bluefields stays green year around, since they bring in moist air from the ocean even during the dry season. The rainiest months in Bluefields are June, July and August. The average precipitation for July is 828 mm and the average amount of rainy days are 26. The daily mean temperature stays within the 24-27°C span year round, and it is quit unusual for the temperature to drop below 20°C. El Bluff is a port and port village located within the bay of Bluefields. The village is situated on a peninsula roughly 9 km from Bluefields. A causway to El Bluff was built in 2004-2007. El Bluff has basic piers and handles both cargo ships and sea-going fishing vessels. 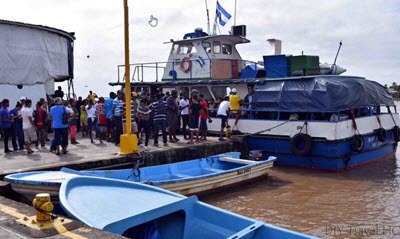 Many of the cargo ships heading for Big Corn Island need to stop in El Bluff to get their paper work in order, and many of them are willing to pick up passengers for a 250 Cordoba fee. To get to El Bluff from Bluefields, take a panga from Bluefield’s docks. They don’t have a schedule, they simply leave when they are full.